You’ll agree with me, website design plays a major role in how your readers engage with your blog, view more pages than the page they landed on and perceive your trust. If you’re an affiliate marketer or sell something on your blog, website design matters even more. A clean and minimal WordPress theme can boost your site loading time, allow your reader to focus on what you say and eventually buy what you sell. MyThemeShop has a range of some of the best WordPress blog themes for bloggers and writers in its portfolio starting from magazine themes like moneyflow to minimalist and optimized for speed themes like Schema. In today’s article, we’ll have an exclusive review of Clean Theme by MyThemeShop which is built to boost conversions on your website. MyThemeShop’s clean theme is a minimalist WordPress theme exclusively built to showcase your content, give you more pageviews and convert readers into subscribers/buyers. What I like the most about this theme is, Clean theme comes with inbuilt customization options like adding call-to-action buttons (unlimited styles) on the header, creating a squeeze page without having to touch a single line of coding. 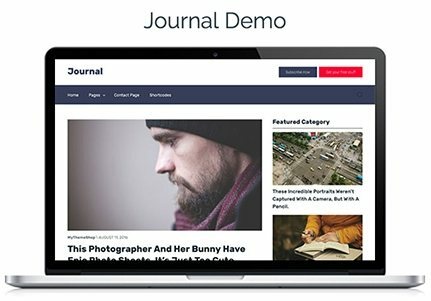 journal or regular blog layout. What’s interesting is, MyThemeShop’s clean theme comes with a default landing page layout with doubles up as a sales page too. This is something that most WordPress themes miss. Let’s take a detailed look at MyThemeShop’s Clean theme features. Features Overview: Is Clean Theme Feature-rich? SEO Performance review: Is Clean Theme SEO Optimized? Monetization Features: Is Clean Theme Optimized For Monetization & Conversions? Clean theme comes with a lot of features that help you build a conversion-optimized WordPress site without having to know coding. here are some of it’s features that make it a deal maker. MyThemeShop’s Clean theme has 1 squeeze page template and 3 inbuilt homepage layouts that are installable with just 1-click. 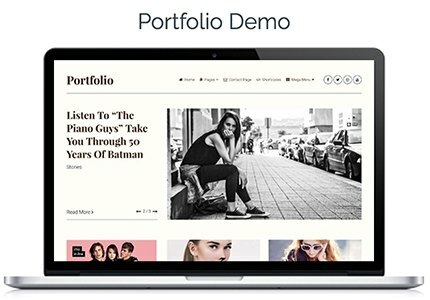 The homepage comes with slider options and 2 or 3 column layout with sidebar. The homepage layouts are clutter-free and simple which means it can be suitable for any niche website. It is also useful for any magazine style site looking to get more page views and eyeball on ads. Please Note: All homepage styles come with 4 different slider types. This is a very minimal layout that can fit any niche site looking for professional design. This has a classic blog format homepage. The articles are horizontally placed and is perfect for any professional websites and authority niche sites. This is another stylish layout which eye-popping content options is suitable for personal blogs, fashion & beauty blogs and blogs geared towards style and glamour. The theme also comes with a landing page template where you can place your lead magnet to collect leads or sell any product. B﻿est for building your list. TIRED OF THE WORDPRESS HASSLE? Check out StudioPress Sites Review » The all-in-one package of best genesis themes + hosting + credibility of StudioPress! Ever wondered how to get that customized feel on the bigger websites (that too without shelling a huge sum on a designer)? If that’s an yes, clean theme has got your back! Two customizable menus: Clean theme offers two menu options. One just right to the logo and other below it. You can customize the font of it, font color, add icons to menu items and much more. Add social icons: Clean theme allows you to add social icons to the header and customize the look and feel of it. Add unlimited CTA buttons: One of the best conversion optimization features of Clean theme is the ability to add unlimited buttons to the header menu with unlimited color and shape options. Isn’t that cool? Header and menu color options: Clean theme allows you to color your header to match your site’s existing branding. You can add a single solid color, choose from unlimited background images or add a color gradient like the StudioPress site’s style. Addition of search bar (optional) to the menu makes it easier for visitors to search what they are looking for. Same goes for your menu bar. Clean theme’s blog layout is also extremely customizable. You can change text font, color and decoration styling via the theme options without having to edit any code. For each different layout mentioned above, you can import their specific widget styling too. One more feature that causes a lot of genesis users a good night of headache is the ability to customize the display of post meta data, date and other values to either display or stay hidden. All of MyThemeShop themes are superbly mobile responsive so that your website looks the same when viewed on any device. The off canvas mobile menu makes sure your mobile visitors can access your menu without any hassle. Design features and user experience wouldn’t mean anything if your site isn’t optimized for performance. An ideal WordPress theme should have an equal balance of design and SEO performance to boost your visits and sales. MyThemeShop themes are always known as performance beasts and Clean theme takes it a notch higher. Let’s see what features makes this theme a performance beast you’d like to power your WordPress site with. As the name goes, clean theme is completely void of speed decreasing elements like heavy imagery or scripts. The simple layout and use of simple CSS styling makes it load like a breeze. Prefetching: Loads the single page faster for a visitor on the homepage and vice versa. Lazy load of images: A common feature of all MTS themes. Lazy load comments: To further decrease loading time. Other features include option to optimize CSS and WooCommerce scripts. One of the proven features of MyThemeShop themes is the ability to reduce bounce rate by showing related posts on the article sidebar. Most of the time readers don’t even go all the way down to the end of the post to check out the related posts. However, with Clean theme, you can add related posts, posts by the same author (so that it becomes more relatable for readers) on the sidebar to increase chances of pageviews. Clean theme also comes with inbuilt floating social share buttons and social media profile buttons. Ability to add Facebook comments: You could add Facebook comments on your blog with just a few clicks. Unlimited color scheme: most themes come with a given set of color schemes which you have to use by default. But, with Clean theme, you can choose from any color that matches your site’s branding. Ability to hide date: You can optionally hide date of your site’s articles and even comment section. This is particularly useful in case you have a huge number of evergreen posts that bring you regular traffic. Parallax effect and lightbox feature: Adding a cool parallax effect can boost your user experience on the site and lightbox will give a special way to view images on your site without having to leave the current page. Clean theme has both the features that you can optionally activate. Up to 5 footer widgets: Footer widgets are a great way to add some extra links, important social media profiles, subscription widgets or simply a range of popular posts to reduce bounce rates. Clean theme has an option to add up to 5 such footer widgets which is something I like. With all the SEO features and design elements, one thing that a perfect WordPress theme must have is optimization for monetization. Without revenue no business site can thrive. Let’s take a look at Clean theme’s monetization features now. Clean theme is a AdSense-friendly theme perfectly optimized to get more clicks on your ads. This is a minimal theme so ads popup without affecting the reading experience. Clean theme is fully optimized for ads and not only AdSense. The “show after x days” feature of ads make it a great option for showing up affiliate offers, right on time on autopilot. Clean theme is fully equipped with WooCoomerce support so that you can sell products without any hassle. With landing pages you can generate leads, sell individual products and build your email list. 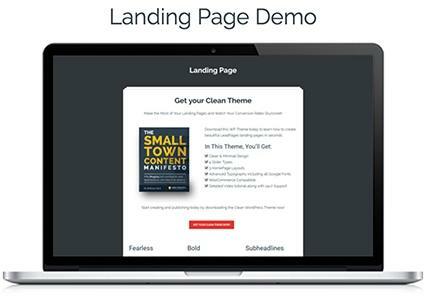 Clean theme comes with an awesome landing page layout that focuses on boosting the conversion of your page. Clean theme is a part of MyThemeShop theme which has exceptional support. The support forum gets regularly checked by support staff and queries answered within minutes and a couple of hours at max. On the pricing front, Clean theme costs $59 to download. If you’re on the lookout of a WordPress theme with clutterless layout, designed to convert then clean theme is your thing. It is a WordPress theme with inbuilt landing page option, is 100% optimized for ads, and has WooCommerce support in case you sell physical products on your blog. Or check out the live demo by clicking the button below. Looking for Clean Theme review? Check out my unbiased and hands on review of it. With advanced ad management settings, lead generation page, woocommerce facility it is cleared powered to increase your revenue. Discover how you can use it to boost your website conversions. Yes, a website design is important. More so, a clean and minimal WordPress theme is not only good to the eyes but also helps the visitor focus more on the king, that is the content. The theme features that you mention here are impressive with great promises. in attracting our clients on to our blogs. The price is bit much, thats why I would be taking some time to get through this cool theme.